Sunday, I tried to perform a chore I hate more than almost any other: I tried to change my watch to Daylight Saving Time. I utterly despise Daylight Saving Time (see It’s Happening Again: Daylight Saving Time Returns to Screw Things Up). So, imagine how I felt when I discovered I couldn’t advance my watch an hour forward! 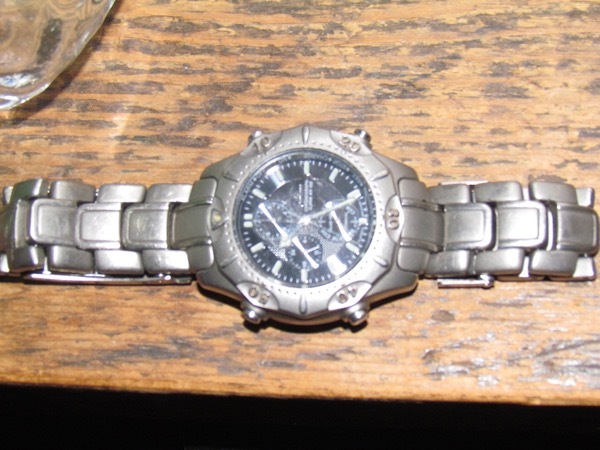 My watch is a Citizen Eco-Drive solar powered chronometer. I’ve had it for a long time. I’m still embarrassed to have spent so much for it; or was, until Sunday. Mark’s trusty old Citizen Eco-Drive watch, catching some early spring rays (Photo: Mark A. Zeiger). I’d had trouble changing its settings a few weeks earlier. So, when I found I couldn’t adjust the time either, and noticed that the second hand had stopped, I resigned myself to sending it in for a cleaning or repair. I knew that I had saved the repair request I’d used before on my computer. “Before” turned out to be 2008. Technically, I’d sent the watch in for repair in 2007, but whoever adjusted the watch made a mistake, which they corrected early the following year. Looking at that repair sheet made me realize that my watch has been an excellent bargain, and an important tool in my life for many years—in fact, I’ll have owned it 20 years come this July! I described my new problem on the form, then began to think about how tell time for the couple weeks or more it would take for the mailing and repairs. Then, I got smart . . . . It occurred to me that I should re-read the watch directions, just in case (believe it or not, I occasionally do take my own advice—see Make Your Belongings Last—Read the Instructions Often!). After 20 years, it’s likely the manual’s filed somewhere, but I searched for it on line, and discovered the solution! It is March, after all. We’ve just come through a long, dark winter, during which most, if not all of my outdoor time required long sleeves, most of which cover my watch. The thing ran out of juice! 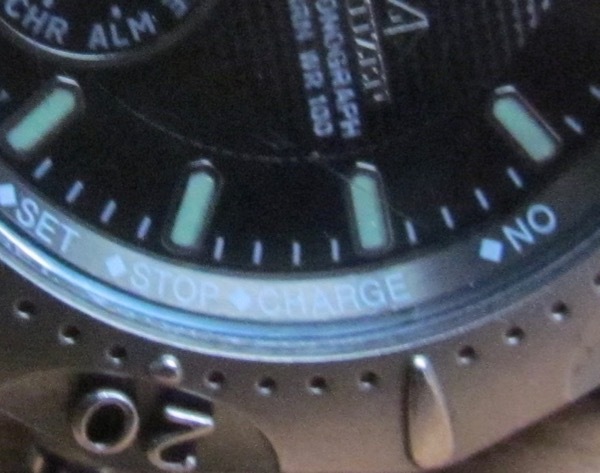 Had I closely examined my watch’s face, I might have noticed that the frozen second hand pointed steadily at the word “Charge” on the face’s outer rim. “Hmm, what could it possibly mean when the second hand points steadily to “Charge”?” (Photo: Mark A. Zeiger). Luckily, this watch gets energy from any light source, not just sunlight. I set it on a shelf close to the kitchen sink light while we did the dishes. It didn’t fully charge, but it harvested enough energy to make it through the day. That seems to be the case these last months. The watch has barely gotten by each day. On the days when it couldn’t, it continued to tell time. Since I almost never need an alarm, or most of the other features, I could easily overlook any problem, even as the device experienced a net loss in energy each day. I can’t say for sure when the problem started (other than within 5 days, the limit of the watch’s operation on low charge, according to the manual). I only noticed it because I tried to change the time for Daylight Saving Time. I learned my lesson. More importantly, I learned that this watch, which I’d always considered a huge extravagance, spending about $300 for it in the ’90s, is actually a bargain. I spent two years shopping, planning, and saving to buy the watch (see Want To Save Money? Set Your Standards Too High!). I think I’ve sent it in for cleaning or repair twice at most, at $30 each. That’s likely less than all the batteries I would have bought to run it in that time, more if I had a watch that requires a jeweler to install the battery. In that time, it’s operated worry-free; I forgot I need to make sure it’s charged! If I take good care of it, it ought to last me the rest of my life. Chances are, I can pass it down to Aly, further extending its useful life. That is, if I can remember how to run the thing properly . . . .
Linn, you’re joking, right? Our correspondence over the years has not led me to expect something like this from you! Not a bad idea, though. I also have a solar powered watch, although it’s a newer digital watch (not as fancy as yours). While it can charge off ‘artificial room light’ The manual suggests it needs 8 hours a day of 500 Lux room-light to get the charge it needs for a day (not a full re-charge). In comparison it needs 48 minutes of 5000 Lux “cloudy daylight through a window” or only 5 minutes of 50 000 Lux Outdoor sunlight. This is similar to any solar panel, while it ‘still works’ in daylight it produces only a tiny percentage of sunlight. I’m impressed you watch is still working after 20 years. I would have expected that the watch stored the power in a rechargeable battery rather than a capacitor and that the rechargeable battery would have died after 20 years. My main reason for having a solar powered watch (other than it having all the features I wanted for a price I was willing to pay for something I tend to end up breaking or loosing overboard every 5 years or so) is that I can use the light and alarms without feeling guilty that I’m wasting the battery. Ekij, the battery is something I’ve wondered about. I have sent this in once or twice for repair. I don’t know if they might have replaced the battery one of those times as part of the service? Sadly, while they service the customer well, they’re not great on communication, so I don’t know. I am curious, though. I bought a cheaper solar powered watch to cover me on those rare occasions when I need to send it in (I had a mechanical self-winder, but I gave it to Aly) that has the same restrictions you describe. My “real” watch didn’t have the same caveats; it seems to charge well on whatever light it collects. I forget if I mentioned in the post that it’s a Citizen Eco-Drive. It’s been worth every penny!